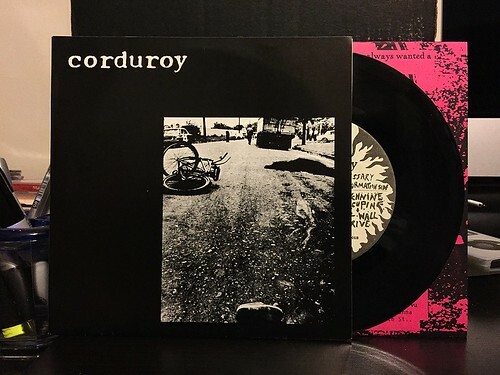 I Buy Way Too Many Records Dot Com: Corduroy - Hum 7"
It was about a year ago where I noticed that my Corduroy 7" collection wasn't complete. I'm not sure how that happened exactly but I knew it was something that I needed to fix. Well, it slipped my mind again until randomly their CD compilation Dead End Memory Lane popped up on iTunes shuffle the other week. That got me over to Discogs and I picked up the two 7"s I was missing to complete the collection. This first one is the Hum 7". It's a four song 7" from 1992 that sounds amazing. There's something about this sort of low budget, fuzzy and poppy punk rock that just takes me back. I feel like you don't hear too many bands like this anymore, but twenty-three years later, I guess things are bound to change. What hasn't changed are how great these songs are. First track "Hum" is an upbeat, but mid tempo pop song with raspy vocals and that quintessential 90's move of dropping to drum and bass only in the first part of the verse when they come back from the chorus. I'm just a sucker for that. Second up is "Cornflake," which is built off of a slower pace and a more subdued guitar sound. Another great song though. "Strychnine Porcupine" is next and it has a bit of a more generic take on punk rock with the the guitar riff in the verse stopping so some vocals can be shouted, kind of like a hundred mile an hour "Bad To The Bone." It's probably the weakest song of the bunch, but it segues into "Four Wall Drive." Perhaps saving the best for last, "Four Wall Drive" is another blast of sing along punk rock with a definite 1990's East Bay flair, but a little more melodic. All these years later and I just love this band. I have no idea how this record was not in my collection, but it's here now. I'll write a bit about their other 7" I picked up tomorrow.